Less than a year after selling to another local couple, a Mediterranean-style home in the Windsor Farms area is in the hands of new owners after a seven-figure sale that topped area residential real estate transactions in March. The 6,000-square-foot home at 1215 Rothesay Circle sold March 21 for $1.49 million, the price tag attached to it when it was listed Feb. 6. Debbie Gibbs with The Steele Group | Sotheby’s International Realty had the listing, representing sellers Tjitse and Elizabeth de Wolff. The couple purchased the property, along with an adjoining half-acre parcel that was not part of this latest sale, for $1.62 million last June. Gibbs, who earlier worked with the de Wolffs in co-listing their previous home in Glen Allen, said the Rothesay property ended up not working for the couple. Tjitse “Theo” de Wolff, a co-founder and principal of Henrico-based Virginia Solar, retains ownership of the adjoining vacant parcel through an LLC tied to another of his businesses, investment services firm Robcar Investments. Gibbs declined to say whether the de Wolffs are staying in town or moving elsewhere. She said she didn’t know of any plans for the vacant parcel. City property records list the buyers as Laurence and Robin Moncol. They were represented by fellow Steele Group agent Maria Brent. Laurence “Larry” Moncol is chief information officer at Advantasure, an Innsbrook-based health care IT firm. Robin Moncol co-owns a local Pure Barre franchise. The couple’s purchase comes in about $500,000 lower than the valuation assigned to it in a recent city assessment. Property records show the latest assessment valued the roughly 1-acre property at $1.9 million. 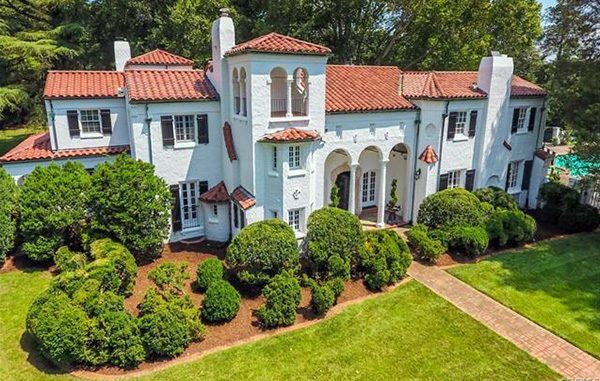 Totaling six bedrooms with four full bathrooms and two half-baths, the nearly century-old house was built in 1925 and designed by architect Otis Asbury. The home was featured in the miniseries “A Woman Named Jackie: The Kennedy Years,” standing in for the Kennedys’ Palm Beach, Florida residence. The house includes a two-story foyer with curved staircase, a balcony and marble floor, as well as a sunroom, octagonal office and library. The property includes a pool, guest house with fitness room and upstairs apartment, and gardens designed by landscape architect Charles Gillette. 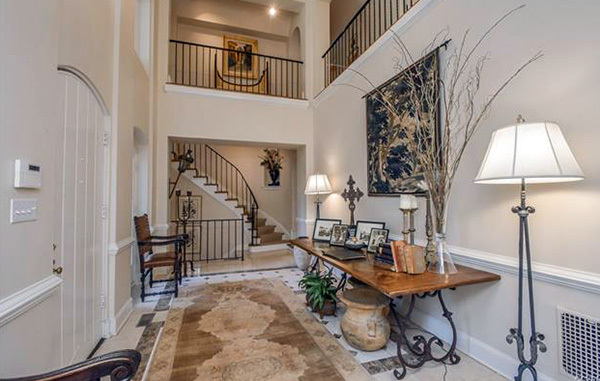 The Mediterranean-style house includes a two-story foyer with curved staircase. Located on a bluff near the Powhite Parkway bridge, the house is just down the street from the 10,000-square-foot Rothesay mansion, which was purchased last year for $3.7 million. Nearby, 1224 Rothesay Circle, totaling 11,700 square feet on more than 2 acres, is on the market for $3.49 million, reduced from its $3.75 million listing last November. • 5906 Three Chopt Road, Richmond – $1.21 million. Listing agent: Melanie Crittendon, The Steele Group; buyer’s agent: Eliza Branch, Long & Foster. • 4 Roslyn Road, Hampton Gardens, Richmond – $1.15 million. Listing agent: Annie Hall, Long & Foster; buyer’s agent: Philip Innes, Re/Max Commonwealth. • (tie) 110 Tuckahoe Blvd., Tuckahoe Terrace, Richmond – $1.12 million. Listing agent: Eliza Branch, Long & Foster; buyer’s agent: Margaret Wade, Long & Foster. • (tie) 4715 Rolfe Road, Westmoreland Place, Richmond – $1.12 million. Listing agent: Jean Longest, Long & Foster; buyer’s agent: Chris Small, Small & Associates. Clarification: The house is located in the Rothesay subdivision, which the MLS listing describes as part of the Windsor Farms neighborhood. City records describe the property as in the “Windsor Farms/Rothesay” assessment area and list the subdivision as Rothesay. The article has been updated to describe the location as the Windsor Farms area. 1 Comment on "Rothesay Circle home returns to market, snags March’s top sale"
This property isn’t in Windsor Farms as the article states.